It’s been a while since we presented our Events component on the AppExchange. In that time, we have received a number of questions, as well as some useful feedback on how to improve it. At last, we have updated the component! Now, it is even more functional and easy to use than ever before. First of all, there’s a new option for how you can add your images to Salesforce – as attachments or as Chatter files. If you choose Chatter files as your image source, you will need to Enable Feed Tracking for AC Event object. Adding a picture to a particular event is simple – just copy and paste the full name of the file to the corresponding field. In the new version, you can also add the Events component to several communities. Thanks to Events Zones, users of different communities will only see events that are relevant to them. You can create different zones, so you can separate out events for your customers and events for your employees. Copy the zone ID in your URL (on the Events Zone detail page) and paste it into the relevant field in the component’s properties in Community Builder. We have also made the Enrolment function optional. 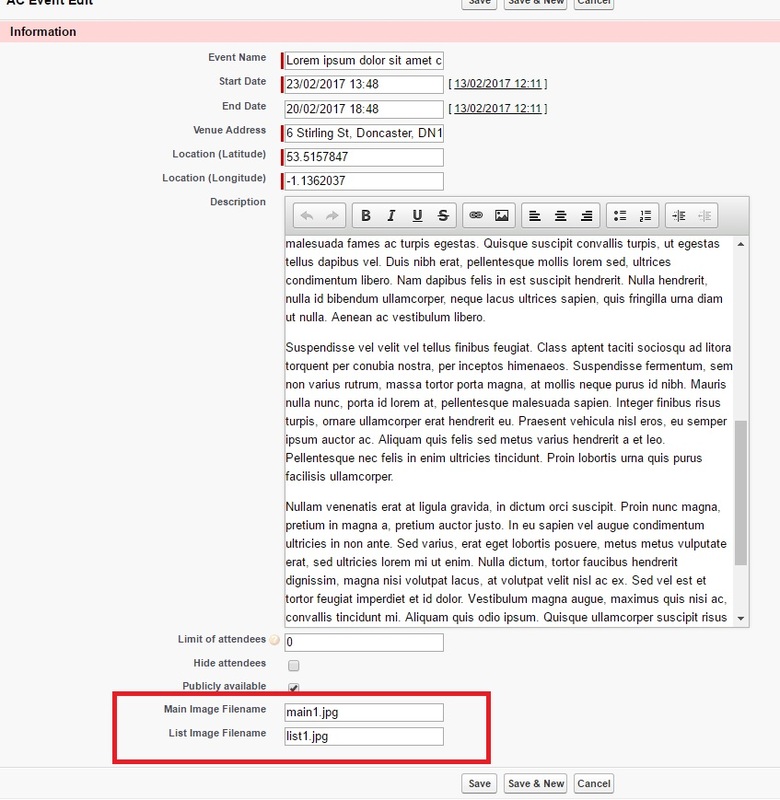 It means that by checking the Enrolment Not Required checkbox, you can hide the Going/Not Going section of the event. And another great feature that we would like to share with you is the separate Calendar Widget, which can be added to your community Home page or any other page. This Calendar Widget will show all the upcoming community events. And last, but not least, our Event component is now supported by Salesforce Lightning App Builder! How awesome is that? We hope you will like our improved Events component for Community Cloud!